Sandy Vaughan is wealthy, but with that comes an overactive sense of entitlement. He is arrogant, selfish, and takes what he wants. These traits are not lost on his colleague, Denis Crawford, who finds himself entangled in a Sandy web of intrigue on a Paris work trip. After a night of infidelity with a married Parisian woman, Sandy discovers his car has been damaged outside the hotel the following morning. A mysterious note has been left behind, requesting a rendezvous with a stranger who will pay for the damage. Who wrote the note, and why request a meeting in an obscure venue away from the hotel? Sandy is warned about accepting the invitation but his arrogance and curiosity trump fear and uncertainty. What awaits him in the gloomy unknown? This is the first of ten (and a quarter) short stories left behind by the Baroness, and all bear those familiar traits of Ruth’s writing style. The stories draw you into the psyche of each of her characters, bringing them to life. Each short is a delightful tale of murder or attempted murder, often with an unexpected and satisfying conclusion. 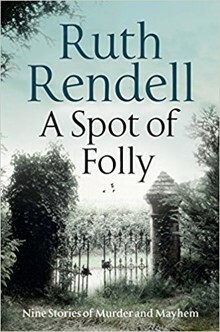 I highly recommend this collection of tales left behind by Ruth to anyone familiar with her work, or indeed anyone not familiar as an insight into her talent for bringing the best, (and worst) out of her characters.